Graffiti vandalism can happen anywhere. The unsightly crime of graffiti can have serious negative effects on the community where the act takes place. When graffiti is not quickly abated, it often sends the message that “no one cares” about the community it has defaced. This type of “careless” attitude lends itself to the public’s perception of an unsafe environment, causing concern for public safety. When a community feels their environment is not safe, these negative emotions can lead to depression and anxiety, as well as further acts of crime and violence. 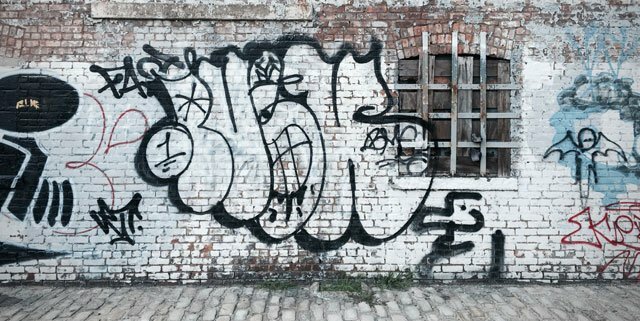 When residents of a community afflicted by graffiti perceive an increase of criminal activity, it can foster the assumption that crime is on the rise. This assumption contributes to feeling less secure and fearful, with the suggested result of community members avoiding street usage and less contact with one another. Less personal contact reduces community bonds and encourages individual isolation amongst members, resulting in the community being more vulnerable to crime. Many individuals who report living in neighborhoods with vandalism and graffiti, retain high levels of mistrust, are suspicious of others, and have fear of being victimized. In this way, graffiti can have a negative impact on a community’s perception of safety and public amenity. The financial costs associated with acts of graffiti are astonishing. Many municipalities throughout the United States employ a team of graffiti abatement personnel, with larger cities spending upward of tens of millions of dollars in taxpayer money to clean publicly defaced property. Private property owners who have experienced their property being vandalized by this criminal act are forced to cover the cost of graffiti abatement from their property. Failure to do so within a specified amount of time results in a mandatory, non-compliance fine. Residents of a community that have been victimized by graffiti sometimes harbor resentment toward local law enforcement and city officials for not acknowledging the residents as being the victim of the crime. When the members of a community are so emotionally distressed by criminal acts such as graffiti, the lasting implications can be felt for years after the crime has taken place. As a city official, take the initiative to deter crimes such as graffiti with a graffiti camera and help the citizens gain confidence in their community.